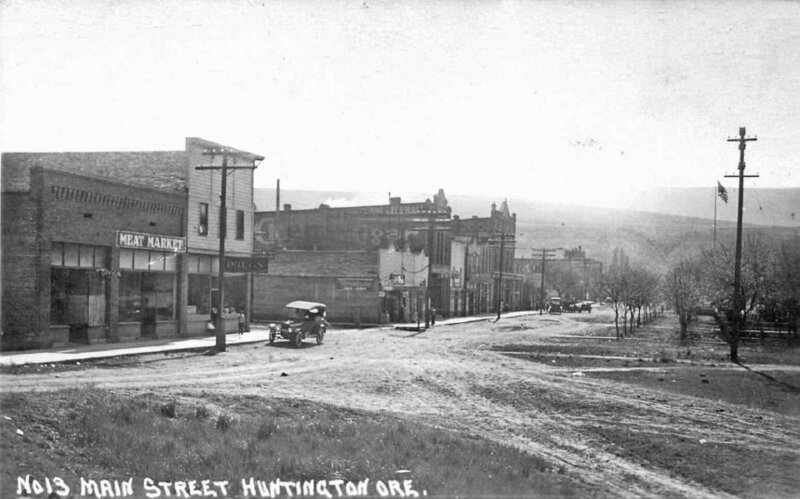 ’Way back in 2010, I wrote about the State Café in the railroad town of Huntington, Oregon, in a posting called Oysters on the Snake. There I promised to write more later about oysters. And, some time soon, I will do that. Three years later, Sam Kee was running a restaurant in Umatilla, Oregon, also on the UP line. The East Oregonian(October 18, 1910 et seq.) ran several articles following the events there when an inebriated former UP employee, S. Lovelace, apparently tried to force Sam Kee to provide food to a destitute man; after Sam declined to do so, Lovelace left the restaurant and returned with a gun, and proceeded to shoot. Sam grabbed a gun and returned the fire. Sam lost a finger, but Lovelace later died from a shot in the groin. The coroner’s jury found that Sam had acted in self defense. On March 20, 1911, fire destroyed three businesses on Umatilla’s Railway Avenue, including “Sam Kee’s restaurant.” He recovered quickly; on May 13, the East Oregonian reported that Sam Kee had leased a building on Main Street and was fitting it up for a restaurant. Sam Kee next shows up in another railroad town, Klamath Falls, on the Southern Pacific lines; an ad for Sam Kee, restaurant, serving chop suey and noodles, appeared in the Klamath Falls Evening Herald of September 13, 1912, and for some time thereafter. The geography and context make me fairly certain that the Wallula and Umatilla Sam Kees are one and the same, but since few newspapers are yet available for searching, and since the name Sam Kee is not uncommon and is also easily misspelled, Sam Kee in Klamath Falls may, or may not, be the same man. What can we deduce from this scattered pile of ostensibly newsworthy miscellany? I conclude that Sam Kee was a reasonably successful restaurant operator who catered to laborers, especially railroaders. The Facebook page of the Huntington Historical Society shows a booklet of meal tickets issued in the 1920s for the State Café, providing $5.50 worth of eating for $5.00; meal tickets were just the thing for the working man. Although Sam Kee may have served chop suey and noodles in Klamath Falls and elsewhere, in Huntington his menu is firmly focused on hearty all-American fare. A close reading shows no chop suey, and four noodle dishes. While the plain noodles and chicken noodles might betray a Chinese cast, listings for noodles and coffee, and noodles and catsup, both read like they are just plain carbs for hungry Joe Railroader, not exotic dishes from Asia. It looks like Sam Kee spent nearly two decades feeding the working men of the railroad West. He also smoked opium, and he probably gambled. The State Cafe offered 22 different oyster dishes. More oyster lore soon, I promise. Thanks to the Huntington Historical Society and to Marylou Colver!